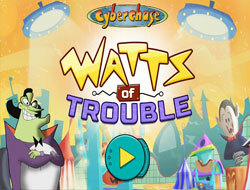 Play the best Cyberchase Games on the internet right now, only on www.friv-games-today.com, where we always make sure to offer you only the best of online games, which is certainly the case with these ones as well. Try them out right now, and you are bound to have a great time! The Cyberchase Games category was created in 22.07.2017 and from there we added more than 57 games for boys and girls that are interested in gaming online. These games were voted in total 65 times and the best game from Cyberchase Games it's Quest 1: Mission Motherboard. 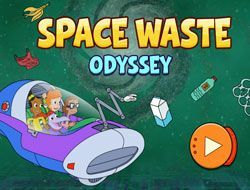 We recommend you to play the latest game added in this category on 21.04.2019 which it's Space Waste Odyssey. If you want Cyberchase Games, just click here. Since Cyberchase is such a popular and long-running show on PBS Kids, we thought that we had to have a category of Cyberchase Games on our website, since there must be plenty of children all over the world who want to play games with these characters, as this show is not only know in the United States, but in other parts of the world as well. It is not surprising at all, since the show began in 2002 and aired until 2010, but it came back on the air in 2013, and since there there have been two new seasons, with another one scheduled to appear sometimes in 2017, so the show is still going strong, which means that there must be a lot of interest into Cyberchase Games, and we want to satisfy that interest, through the only way we know we can, and that is by offering you all the possible and available games based on the show, all in one place, so you need to look absolutely no further than this page to have a lot of fun, guaranteed! The Cyberchase Games category is going to be a great place for lovers of math, science, and all things technology, since these are very important aspects of the show as well, which have come across into the online gaming world very easily, and we think that if it was fun doing math and thinking all sorts of things by watching the show, it is going to be even better when you interact with these things directly, and have a tremendous time, like you can clearly do only on www.friv-games-today.com! Now, although this show has been on for more than a decade, we realize that there must still be people who have never heard about this show before, and if you belong to that category of peole, you might not be interested in playing these games. Well, that is certain to change once you read this next part of this description, where we are going to tell you what the show is about, and who are the characters in it, and after you learn about that, you will surely want to play Cyberchase Games as well as soon as possible, and because of that, we will make sure to also tell you what kinds of games you will find available on this page, which will only make you more curious. The show follows three avarage kids from Earth, Jackie, Matt, and Inez, who are one day brought into the Cyberspace, which is a digital world, and their purpose there is to protect it from the evil Hacker, who is threatening to destroy this world. This world is called the Motherboard, of course, and the evil Hacker has as assistents two very clumsy creatures, Buzz and Delete. Of course, the three children are in a whole new world, and as it is the case in these situations, they need someone from there to help them as well, and that is Digit, who is a cyberbird, one that does it’s absolute best in order to help the kids in their many missions. Of course, in each episode we see a mission which involves doing math, finding strategies, thinking, and developing critical thinking, all the while teaching children about things like the environment, or other things like the importance of friendship. Of course, when you will play Cyberchase Games, you will do these things even better, as you will do them directly, through the game. Of course, this brings us to telling you about the games on this page, which can vary from math games, thinking games, logic games, strategy games, and plenty others, which are combined with adventure games, action games, or puzzle games for example. One thing is certain, you can pick any game from this page, randomly if you want to, and you are more than certain to have a really great time playing it, so why would you not take this chance and do that right now? Browse this page, find the game whose picture or title you find the more interesting, and then start it, letting yourself be immersed in a brand new world. Of course, in each game we explain in the descriptions what it is you have to do, and how you do it, so there are no chances you will not get into the games prepared, and then do a really awesome job at playing them, don’t you think? Well, when you are done playing Cyberchase Games, also remember about our many other categories, which we hope that you will visit, as you are bound to find something interesting to play in them as well, as we are filled with the most amazing games on the internet, and we are very proud of that!